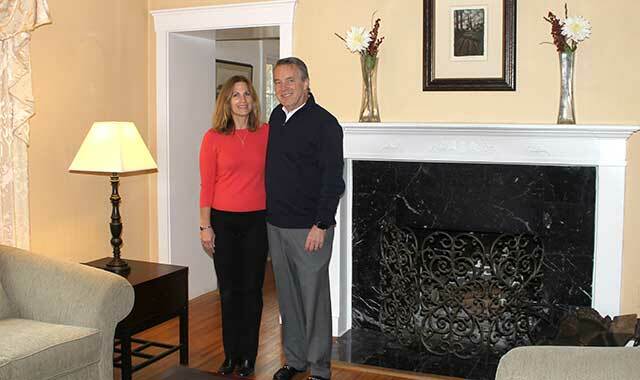 Jim and Lisa Eby have preserved the memory of their home’s former owners on the steps of the couple’s Elgin bungalow. Lisa has made contact with six of the eight families who once lived there. The staircase in Lisa and Jim Eby’s 1926 Elgin bungalow truly is one-of-a-kind. Last year, Lisa had each wooden riser marked with the last name of a former owner of her home – eight in all, before the Ebys bought the house in 1989. Eby has been in contact with the families of six former owners. Only the Rahns and Hoods have eluded her thus far. One former owner, Julianna Westfall Bendickson, visited the Ebys and sat on “her” stair. Historical societies and local museums receive research requests frequently from those interested in having their house plaqued. A commemorative plaque typically recognizes that a home was built 100 or more years ago, has historical significance and still is representative of the time period in which it was built. 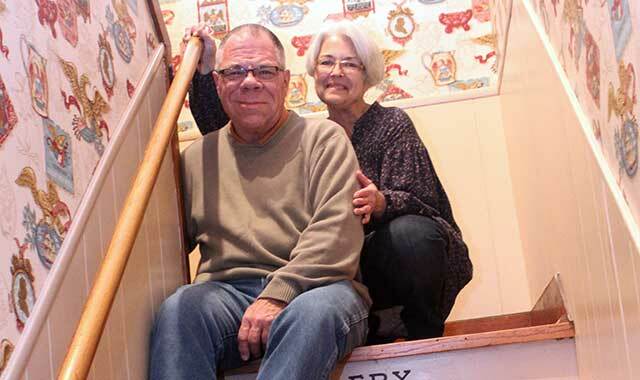 “Early on, when we started the plaquing program, there were still some people who knew previous owners in a house or, in some cases, who lived there,” says Jack Wendt, who’s been researching homes for 52 years – ever since he helped to found the Dundee Township Historical Society. Wendt finds it’s important to preserve the memories of our homes and their former owners before their tales are gone forever. Jessica Strube, curator of collections and exhibitions at the Geneva History Museum, is typically one of the first connections for local home researchers. Often, they come by way of the city’s Historic Planning Commission, which sends homeowners to the museum before approving exterior renovations on an historical property. Because there’s now a greater appreciation for historical styles, a commission typically wants to know when a home was built and that outside renovations are consistent with the original architecture. “Otherwise, you have things like a Cadillac with Volkswagen hubcaps. It looks ridiculous,” says Steve Stroud, a volunteer at the Elgin History Museum and a former member of the Elgin Heritage Commission. Homes that are located in an historic district generally must adhere to stricter guidelines, but Strube says a house that’s plaqued doesn’t necessarily have the same restrictions. “Plaquing is just a personal designation, but I think it’s a nice way to acknowledge the home’s history,” she says. Sometimes, homeowners begin the research process because a piece of the home has piqued their interest. That’s what happened to Dave and Jacki Saylor of Geneva, who moved into their old Colonial-style home in July 2015. An inspector told the Saylors their house was built in 1919 and noted the floors probably had been raised to accommodate indoor plumbing. According to the inspector, the original structure likely didn’t have a bathroom, says Dave Saylor. The couple reached out to Strube and the Geneva History Museum to see what else they could learn. What museum technician Gayle Meers dug up astonished the Saylors. Meers found the house wasn’t built in 1919; it actually was built 10 years earlier. A thick file including tax records and an obituary of the original owner revealed that the first owner of the Saylors’ home was the namesake for the adjacent street. Saylor also learned about the city’s history. Though he knew the city had a nice hotel called the Herrington Inn & Spa, he didn’t realize Herrington was the city founder. Dave and Jacki Saylor started researching the history of their Geneva home after an inspection turned up some unexpected evidence of the original plumbing (or lack thereof). Finding information about an older home is no small task. The depth of a research project depends on where you live and what sort of information is available. If you own an Elgin bungalow from the 1920s, Stroud can finish basic research in about eight hours, mainly because he’s compiled such a large database of those homes in the area. In the past 18 years, he’s researched more than 10,000 homes around Elgin, some 2,000 of which are bungalows. For an older home, maybe one built around the 1870s or 1880s, Stroud might need a few days to fully investigate. Wendt finds that a typical research project takes him between 10 and 15 hours. There’s a lot of fact-checking to do, especially if a piece of information seems dubious, he says. It’s very seldom that researchers can’t find anything about a home. “There’s almost always a paper trail to find out who did what, when,” Stroud says. Typically, that paper trail winds through government documents, newspaper articles, personal journals, old photographs and local peoples’ memories. “I would say probably 75 percent of the time, we find something for a request,” Strube says. Many homeowners are content to let a researcher uncover their home’s secrets. Others like to do the work themselves. Eby did a bit of both. Stroud provided her with most of the historical information about her Elgin home, but Eby searched social media sites and questioned neighbors. If you plan to research your home’s past by yourself, it can be a fun adventure, but it’s best to have a game plan. Your top goal should be to figure out the year in which your home was built, says Strube. From there, you may be able to determine who built the home, who lived there and the significance of its inhabitants. Next, see if your home provides any clues to its past. A pile of papers in the basement could contain family information about previous owners. An item in the attic dated 1899 could mean your house was built around that time period, or long before. In her own Batavia home, Strube has a gorgeous built-in hutch. After a bit of sleuthing, she learned a previous owner had been a cabinet maker. “It makes sense that this beautiful hutch is in my home; he probably did all of the work on his own,” Strube says. Researchers also recommend visiting a local historical society or history museum. Often, you can look through the group’s research files on your own, for a small fee. If your house is in Stroud’s database of 10,000 homes, for instance, you’re in great shape, he says. And, if your house was built by a particular contractor, Elgin’s museum has bid books that can provide incredible detail about a number of homes built between 1895 and 1908. Home researchers should also plan to visit the county recorder’s office, in person or online. Kane County’s tract records contain records of land sales dating to the 1840s. Remember to wear your detective cap, because the information you’re seeking isn’t always black-and-white. Rarely will you find a document that plainly states a property contained a “modern dwelling,” which would tell you in no uncertain terms that a house had been built on that lot, Wendt says. If a property wasn’t worth much, it was probably a vacant lot. “When we find a card that shows a large increase in price, we assume that somewhere previous to that date on that card, a structure was built on that property,” Wendt says. Check the county assessor’s office to find the build date of your home. Many times, a property’s value has been assessed and will include a legal description of your property. “They’re wrong sometimes, but usually they’re close, within five or 10 years,” Strube says. Look through other public records, as well. Libraries often have telephone directories, newspaper clippings, school yearbooks and more. The Geneva History Museum has directories from 1857 through the 1990s, with a few intermittent gaps. The earliest directories contain addresses but not phone numbers, largely because phones weren’t common in area households until the turn of the last century. If you look for a house on a certain street, you might find the name of the owner. Once you know a homeowner’s name, search obituaries to learn about his or her life. When Stroud was looking up information for Eby, he found obituaries for William and Ida Watermann that listed Ida’s maiden name, Schultz, and detailed their marriage at a church in Bartlett. That information was eye-opening, because Ida turned out to be the great-aunt of Eby’s best friend in high school. Strube advises searching internet sites like Ancestry.com to see if you can find any additional clues about the families who lived in your home. Don’t rule out Facebook or other social media sites. When the Ebys had their house plaqued, Lisa Eby posted on Facebook a photo of the plaque, which included not only the year the house was built, but also the name of the original owners, the Watermanns. Originally, the plaque read “Waterman,” but a friend of a friend who saw Eby’s post contacted her and said, “My grandfather’s name is spelled with two ‘n’s.” Eby had the plaque changed. Mick Zollers, a Geneva History Museum volunteer for 16 years, constantly taps his network while doing research. Wendt, who bought his 1899 Victorian home in 1967, managed to contact a former owner who was living in Arizona. Don’t be upset if, after all your research, you can’t pinpoint the exact year your house was built. Even professional researchers sometimes guesstimate. For example, the four houses Wendt helped to plaque in Dundee Township this past November have plaques that contain a small letter “c” before the year it was built. This mark indicates that the house was built “circa” the year listed. Last but not least, appreciate any gem you find, especially old photographs. Pictures surface only about 50 percent of the time, Strube says, although your chances increase if you live in an historic district. Stroud believes there’s a consistent feeling among those who spend the time to research the history of their home. This entry was posted on Wednesday, December 7th, 2016 at 11:57 am	and is filed under Features, Top Posts. You can follow any responses to this entry through the RSS 2.0 feed. Both comments and pings are currently closed.